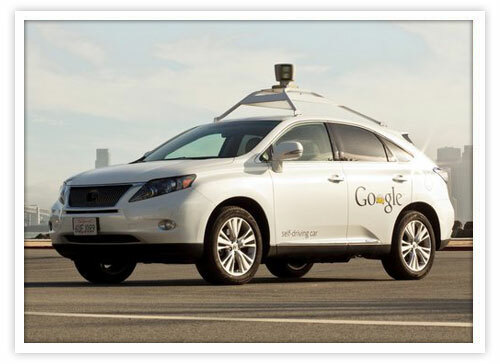 Google’s driverless cars may be here sooner than you think. The United States has already allowed driverless licenses, and non-human navigation has been approved in Nevada, California, and Florida, with other states sure to follow suit. This is a great step in the right direction for the advancement of the driverless car, as road laws begin to catch up with this exciting technology. The concept of the driverless car can be explained very easily. An advanced computer system uses lasers, cameras, and GPS to understand the cars surroundings and react accordingly. With computers on board, the driver-less car is a cold and calculated machine that does not make decisions on emotion. What will be the future of the Google car? Will every driver have one, or will there only be a select few on the road? These questions have no answers yet, but there is one thing that will need to happen, and that is communication between all of the self-driving cars on the road. With the ability to process thousands of images, locations, and distances, communication between cars will be key in relaying instantaneously information. This is where data centers come into the picture. The information communicated between cars will have to be consistently up-to-date because of the massive amounts of data being stored and transferred. The car’s rotating laser on it’s roof captures 1.3 million bits of data every second, which doesn’t even include the radar pulses and video feeds. All of this data must be stored somewhere, most likely on web servers. Servers would be the most convenient, because they are already set up to store and release information within fractions of seconds. Real time data would be communicated between cars and historic data could be stored on web servers in order to predict future events. “Right turn on red after 5pm only” would be entered into this database web server once it is first encountered. Not only would these cars have current information, but by using historic data, they would learn to understand trends such as weather, road conditions, and climate. Temporary road hazards such as “Ice Ahead” could be entered into the cars system so the system could understand the conditions. The car would be able to determine the exact radius of the icy conditions, as opposed to a human driver, only understanding that a hazard is ahead, but not the details. Alone, the driverless car will have no issues doing it’s automated thing on the road. If we put hundreds of driverless cars within the same vicinity, communicating between cars will be essential. A powerful wireless way of communication will be necessary for this type of communication to occur. Hopefully by then, cellular type communication will be in it’s most advanced stages. Driver-less cars will be able to relay information taken from web servers to each other, making for a smart fleet of autonomous drivers. The amount of server space will be endless, judging by the consistent driving habits that we currently have. Driverless cars will always be submitting up to date information to the mass array of servers that hold the information of all driverless cars. Most likely, there will be a cutoff date in which data will only be stored that is 3 years old or less. As you can see, the Google car is destined for bigger and better things. With the ability to store real time information on remote servers, all driver-less cars will be able to communicate seamlessly via wireless internet connection. Storing historical data on remote servers may be able to predict the future in the sense of road conditions and weather for certain regions. All driverless cars will have access to this data, sending them into history as being “smarter” than human drivers.